The West Parry Sound Detachment of the Ontario Provincial Police is inviting the public to watch a special performance of thrilling manoeuvers by the OPP Golden Helmets Precision Motorcycle Team. 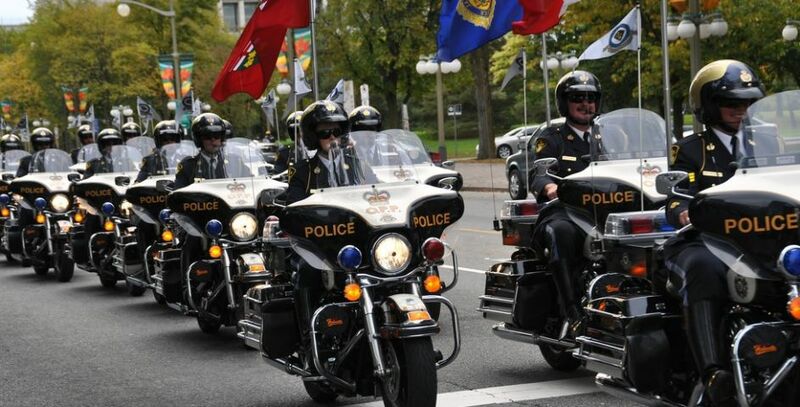 The OPP Golden Helmets are scheduled to be performing on downtown James Street in Parry Sound on Saturday September 15, at 1:30 p.m.
Each year they tour the Province of Ontario giving exhibitions of superb riding skills at fairs, festivals and parades. The 20 motorcycles used by the Golden Helmets are Harley Davidson Police Specials. These motorcycles are the same ones used on normal patrol. During the performance the riders take their machines through a series of complex patterns, which are intended to demonstrate the manoeuverability of the machines and the rider's skills.